them in due course to a charity of your choice. 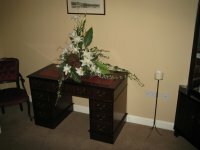 At the time of making funeral arrangements, it is not always easy to realise the emotional benefit that is gained after the funeral by having somewhere to go, a place that you and your family can go back to,knowing that loved one is there. It has only recently been acknowledged that simply having a relative's cremated remains scattered or buried in a garden of remembrance does not assist the healing process after the funeral. Today most cemeteries and crematoria that are administered by local councils offer the facilities of small graves that can be purchased solely for cremated remains. These "cremated remains" graves can be visited by your family allowing you to pay your last respects and mark the grave with a headstone. At the time of making arrangements for a funeral, it is not always easy or necessary to determine what your future memorial requirements will be. In the case of existing memorials, it will probably be necessary to remove the headstone from the grave prior to the funeral. When the funeral has taken place it can take some months, depending on the condition of the ground, before the grave will be ready to take the headstone or a new one. Choose a design and material to meet the regulations of the cemetery or churchyard, harmonise with the surroundings, and choose a suitable inscription to withstand the weather. (Remember, perhaps, a possible future inscription in matching lettering). When comparing prices, make sure that the size, style of lettering and all fees have been included. Take extreme care and check thoroughly any inscription spellings. The layout is usually left up to the stonemason.